The Great Seljuq Empire (1037-1194 CE) has been described as a period with stunning scientific and artistic achievements in particular in Iran. Their capital became Esfahan in central Iran under Malikshah I (d. 1092). Among the many Seljuq monuments found in Iran, Esfahan’s Great Mosque, or Masjed-e Jomeh, is probably the most remarkable. The Great Mosque’s huge courtyard of 65 by 55 meters with its four iwans , the standard model of later Iranian mosques, provides the two axes, one in the Makkah direction and the other perpendicular to it. The iwans differ considerably in their composition and decoration. The most important iwan to the south is connected to the larger of the two main domes which contains the mihrab indicating the direction of prayer. The western iwan is the most unusual and complex of all. While all iwans had been added to the Seljuq mosque after a fire pillaged by the Hashashiyyin sect in 1121 CE, their decorations are from the Timurid and early or even late Safavid periods (late 15th till early17th century) . The western iwan and its counterpart to the east are called the sofe of the student (shāgird) and master (ustadh), respectively. Although both iwans were built at the same time as the southern iwan (early 12th century), both of them are, “in their visible shape, late Safavid works of the seventeenth and, in case of the west one, even early eighteenth centuries”, as Grabar in his book about the Great Mosque writes . So, while dating of the specific decorations may be highly problematic if the artisan had not signed his work, there is constantly restoration work which will inevitably change the appearance of the ‘living monument’ over time. More information about Esfahan’s Great Mosque, its amazing history and stunning architecture, can be found here. There were suggestions that there had been a breakthrough in creating (almost) Penrose tiling in the late 15th century, in particular on the Darb-i Imam in the Great Mosque’s vicinity. In the supporting online material of Peter J. Lu and Paul J. Steinhardt’s article in Science magazine, you may find a picture of the western iwan where the authors suggest that the tiling can be subdivided in the same way as the respective pattern(s) on the Darb-i Imam shrine . You can easily identify the pattern at the inner sides of the iwan’s portal. It is huge, about one meter wide and up to 10 meters high. At first glance especially this site seems to be an anomaly in Esfahan. 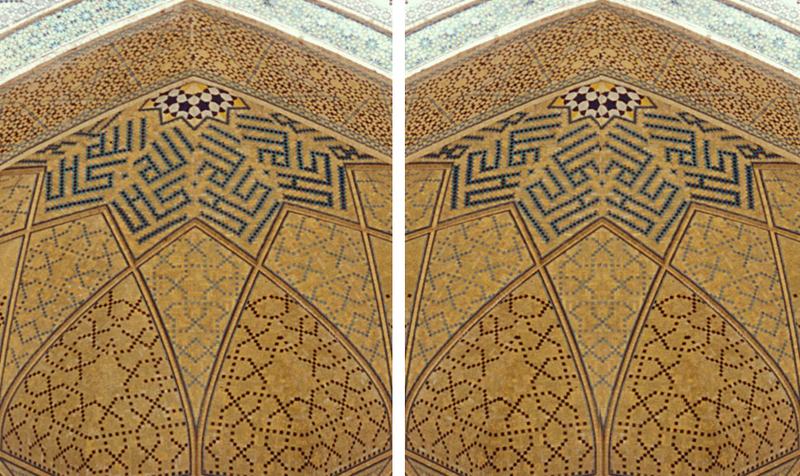 Lu and Steinhardt also suggested so-called girih tiles to facilitate the incredible precision of the tiling . As Lu and Steinhardt point out, based on a blurred picture taken from the book Design and Color in Islamic Architecture by Seherr-Thoss (Smithsonian Institution, Washington, DC 1968) the large-scale pattern consists of large decagons and bowties . When reconstructing the small-scale pattern, I could identify similar but not the same subdivision rules which transform the large bowtie and decagon girih-tile pattern into the small girih-tile pattern of decagons, bowties and elongated hexagons as on the Darb-i Imam. For instance, the pentagonal areas encircled in magenta can be filled with a fourth girih-tile described by Lu and Steinhardt, the rhombus. See, for instance, the rightmost picture of the panel and, in particular, in the magnification below. So, the pattern on the western iwan of Esfahan’s Great Mosque differs from that found on the Darb-i Imam. Much of the discussions after the paper of Lu and Steinhardt had been published were about the possibility of medieval artisans had consciously or unconsciously been able to create what has become known as Penrose tiling, five hundred years before its description in the West. It might be concluded, however, that neither the dazzling pattern on the Darb-i Imam nor that on the western iwan of Esfahan’s Great Mosque are Penrose tiling, simply, because they are not aperiodic. Lu and Steinhardt had been criticized not having given due regard to extensive previous work on Islamic Art. In particular, reading an almost forgotten book about Fivefold Symmetry, edited by István Hargittai (World Scientific, Singapore 1992), might be revealing. Much of Lu and Steinhardt’s ideas and conceptions may in fact be found there, not only Emil Makovicky’s paper on the 800-years-old Gunbad-i Kabud in Marāgha in northwestern Iran. Emil Makovicky’s response to the Science article articulates that neither the Gunbad-i Kabud pattern nor that on the Darb-i Imam are aperiodic, and hence do not represent Penrose tiling. Moreover, when considering the reconstructed pattern on the Gunbad-i Kabud in both Makovicky’s (Fig. 8b ibid) and Lu and Steinhardt’s (Fig. S6 of supplementary online material) articles, it may in fact be assumed that the pattern on the western iwan of Esfahan’s Great Mosque is not entirely dissimilar to the former. For instance, next to the western iwan the pretty famous Timurid gate had been moved and inserted into the façade. It contains signature and date of its creator Sayyid Mahmud-e Naqash, 1447. A similar, highly decorative floral style can be seen on the south iwan and on the Darb-i Imam shrine, some 300 meters west to the mosque, which is dated 1453. By the way, on the gate the date 1317 appears which translates into 1939 when restoration work had taken place. The Timurid gate near the western iwan of Masjed-e Jomeh leads to a room with a stunning dated (1310) mihrab of sultan Oljatu, the great Ilkhanid Mongolian ruler in northern Iran. The inscriptions are, according to Oleg Grabar, not qur’anic, but contain traditions about mosques and about Ali. Amazing that Oljatu in fact converted to Shi’a Islam in 1310. “[A] celebrated square panel in the western iwan [which] is one of the most commonly cited examples of complex geometric ornament using writing. It is easy to argue that here is a wonderful example of a simple design rotated 45 degrees which acquires two separate values, one as a carrier of geometric forms filled with (by the time of the panel) antiquarian writing, the other one as a violator of the sequence of both writing and architecture by forcing one into rare contortions to read the writing. And one could argue that here is precisely the use of geometry which gives it the high status so frequently heard and read about. In fact, however, the corner spaces contain the following rather undistinguished pious quatrain: ‘As the letter of our crime became entwined [i.e., grew so long], [they] took it and weighed it in the balance against action. Our sin was greater than that of anyone else, but we were forgiven out of the kindness of Ali.’ The central square is taken up by a signature of one of the most active craftsmen busy repairing the mosque in the seventeenth century. Even though formally related to the angular style of writing on the face of the iwan and in fact much more sophisticated in design, this panel is nothing more than a ‘plug’ for a local artisan.” The exact construction of a similar “square from three squares” has been described in Abu’l Wafa’s (d. ca. 998) book “On the Geometric Constructions Necessary for the Artisan”. As Alpay Özdural describes it in his article “Mathematics and Arts: Connections between Theory and Practice in the Medieval Islamic World” (Historia Mathematica 2000; 27: 171-201), contemporary mathematicians frequently held so-called conversazione with artisans explaining them how to create new inspiring geometric decorations. A second visit, after 2007, of the Darb-i Imam shrine end of December 2008 revealed that the patterns were in fact temporarily not visible. Because of the upcoming Ashura festivities the complex was heavily decorated with religious banners and transformed into a place of observance for daily husseiniyyas. I have mirrored, for example, the right part of a picture of the arch borrowed from ArchNet (left part of the panel) and can demonstrate (right part of the panel) that each tiny tessera on one side (as small as, say, a square centimeter) can be found in exactly the same place on the other side of the vault. It may be of interest to note that Peter Lu visited Esfahan only after his paper in Science magazine which attracted considerable public interest worldwide. The political situation before the US American election in the end of 2008 largely complicated the procedures for issuing visas for Iran, in particular for US citizens and individual travelers. Thus, the whole article was based on the diligent work in libraries, as Peter Lu mentions in a colloquium where he reports on his amazing findings. Just by comparison I would not assume that Sayyid Mahmud-e Naqash, who created and notched the late Timurid, beautiful floral, decorations on the south iwan and the gate in the western façade of the mosque was the one who designed the decagonal patterns on the west iwan (and similarly different decorations on the Darb-i Imam, as well). But who knows? It would be interesting to learn how contemporary artisans repair, with incredible precision, the decorations. This entry was posted in Academics, Art, Iran, Islam and tagged Alpay Özdural, Darb-i Imam, decagonal, Emil Makovicky, Esfahan, girih tiles, Gunbad-i Kabud, Marāgha, Masjed-e Jomeh, Paul J. Steinhardt, Penrose tiling, pentagonal, Peter J. Lu, quasi-crystalline, Seljuq, western iwan. Bookmark the permalink.